Need some help writing a letter of recommendation for employment? Check out our free downloadable recommendation letter templates for some guidance! Writing a letter of recommendation for employment purposes can be both difficult and time-consuming. Not to mention, another person’s career could be riding on your words. Our free downloadable recommendation letter templates can be quickly and easily customized to create a professional and persuasive letter. Or, use one of our many samples to find inspiration and write your own. Trying to write a recommendation for a student or teacher? Check out our library of education related templates and samples. As a supervisor, a recommendation letter written by you for an employee holds a lot of weight. As such, it’s important that your letter is as convincing as possible. Our experts designed this template to hit all the most important parts needed to write a strong recommendation letter for employment. Simply download the free template as a MS Word doc and customize it with your employee’s details. Since companies take the word of management much more seriously than anyone else, you should emphasize your position as your employee’s supervisor, as well as how long you have managed them. In doing so, everything you say in your letter will be strengthened. Give detailed examples of how your employee used their skills and knowledge to benefit your company in an impressive way. Make sure that the skills and achievements you include are relevant to your past employee’s target company or job. When talking about a candidate’s personality traits, include those that not only help them contribute to a positive work environment, but also enable them to succeed professionally. Click below to read a completed example and get inspiration. It is my pleasure and honor to recommend Ileana Flores for the role of Project Manager at Target Robotics. I have worked with Ileana for 4 years as her manager at Dolphin Technologies, where she used her excellent leadership skills to deliver spectacular results in the role of Assistant Project Manager. I am confident that Ileana’s exceptional skills, professional experience, and personal qualities will make her a powerful asset at Target Robotics. As an Assistant Project Manager, Ileana constantly demonstrated an extensive knowledge of project management tools and techniques, as well as superb communication skills. In particular, her in-depth knowledge of Scrum Methodologies helped increase the amount of projects completed on-time and within budget by 23%. Moreover, her uncanny ability to facilitate clear communication between different teams and departments ensured misunderstandings were few and far between. What’s more, Ileana’s extraordinary focus and strategic way of thinking always made her a stand-out member of the team. Whenever there are problems or flaws in the production process, she showcases her superb analytical qualities to quickly identify the issue and deal with it before it can become too serious. Unfortunately, due to her mother’s medical condition, Ileana had to move out west and we no longer have the pleasure of working with her. Her loss is greatly felt, but she will undoubtedly continue to thrive at Target Robotics. Ileana has my highest recommendation for this position. I have no doubt she will make a strong addition to your team. Please feel free to contact me if you have any questions regarding her candidacy or past work. When a colleague asks you to write a letter of recommendation letter for them, it can be a little daunting. You may feel like you aren’t really qualified to write such a letter. We’re here to tell you that that’s not true at all. Our handcrafted template and sample will show you exactly the kind of points you can focus on to write a powerful and persuasive letter from your position as a coworker. All you have to do is download the free template as a MS Word doc and customize it with the details of your colleague. Create a strong base for your recommendation by outlining your working relationship. For example, perhaps you were on the same team or worked on certain projects together. Cite detailed examples of your colleague’s achievements and skills that you witnessed firsthand when working with them. If you worked closely with your coworker for a long time, highlight the positive aspects of their personality that make them a desirable person to work with. Emphasize the value of your colleague as an asset to their target company and maintain a positive and enthusiastic tone throughout the letter. I am more than pleased to have the opportunity to recommend Zachariah Scott for the role of Senior Digital Marketing Specialist at Ion Software. I was honored to work alongside Zach for 3 years on the marketing team at Genos Tech. Zach was always an outstanding member of our team, and I have always been impressed by his professionalism and admirable personal qualities. As an Online Marketing Specialist, Zach constantly demonstrated his exceptional analytical skills and extensive knowledge of best SEO practices. In particular, his intimate familiarity with the intricacies of Google Analytics enabled him to reduce the bounce rate on our most essential pages by an average of 20%. Moreover, he consistently produced top-quality content that ranked highly for all of our target keywords. In addition to Zach’s impressive portfolio of professional accomplishments, he has one of the best personalities I have ever had the joy of working with. He is a fun-loving and friendly individual who always treats everyone in an amicable and welcoming manner. There is no one at our company that does not think of him fondly. Unfortunately, due to his wife’s need to relocate for her job, I will no longer have the pleasure of working with Zach. Having witnessed his long track-record of success and admirable character, I assure you that he will more than excel in the role. The words “our loss is your gain” have never been more true. I wholeheartedly recommend Zach for this position. I am confident he will become an invaluable addition to your team. Please feel free to contact me if you have any questions regarding his character or past work. Writing a character reference (or personal letter of recommendation) for a friend can be a huge aid when it comes to helping them land a job. However, figuring out exactly what to write can often be difficult. Our expert’s template and sample letter will show you exactly what to include to write a professional and convincing personal reference. Just download the free template as a MS Word doc and customize it with your friend’s details. Although a character reference written by a friend will have a much less formal tone, you should still keep your letter as professional and polite as possible. Think of some of your friend’s skills and achievements outside of the workplace that would be useful when applied to their target job. As a friend, you are intimately familiar with the applicant’s personality, so your primary focus should be on highlighting their strength of character and positive personal traits. Mention how your friend’s positive personality traits would be of benefit in a professional setting. I couldn’t be happier to recommend my close personal friend, Bianca Jones, for the open wait staff position at the Italian Pasta House. I have known Bianca for 8 years and can confidently say that she is a person of impeccable character. Ever since we first met, Bianca’s incredible friendliness and interpersonal skills have always impressed me. I remember one instance in particular when she accidentally bumped into an angry man who subsequently began spouting curses at her. She utilized her exceptional ability to remain calm in the face of confrontation to diffuse the situation with a warm smile and a sincere apology. More importantly, everyone who interacts with Bianca is always blown away by her selfless, kind, and warm-hearted nature. Whenever there is any need for volunteers in our town, Bianca always enthusiastically signs up without the slightest hesitation, eager to help in any way she can. It is truly a privilege and an honor to be considered Bianca’s friend and I wholeheartedly recommend her for this position. I assure you that her commitment to her professional career, as well as her high moral values are without question. I have no doubt she will make a strong addition to your team. Please feel free to contact me if you have any questions. A lot of people get confused about exactly how to write a recommendation on LinkedIn. At first glance, they seem like a completely different animal from a regular recommendation letter, but they are essentially just a more concise version. Our professionally crafted sample and template will give you the exact formula for writing a stellar LinkedIn recommendation. Download the free template as a MS word doc and fill in all the necessary details. Keep it short and sweet. Potential employers browsing LinkedIn profiles want to be able to get a good idea of the strength of a candidate in as little time as possible. Think about what paragraphs you would include in a full letter, and then convert each one into 1-2 sentences. For example: how you know the candidate, their professional strengths, their positive personal traits. Make your recommendation personable. Try to tell a story that makes the potential employer feel like they are getting to know the candidate better. Although you want to keep your LinkedIn recommendation short, make sure you include an example or two that demonstrates the candidate has the abilities or traits you mention. Few people are fortunate enough to have the chance to work with a Sales Associate as outstanding as Jim Harding. I met Jim when we worked together at Viper Tech, and I had the pleasure of working with him for 4 years. I was constantly impressed by his exceptional ability to close a deal, and I’ve never seen anyone exceed sales quotas as effortlessly as Jim. Not to mention, his bright and jovial personality always improved the mood in the office. I would highly recommend Jim for any position he chooses to pursue. 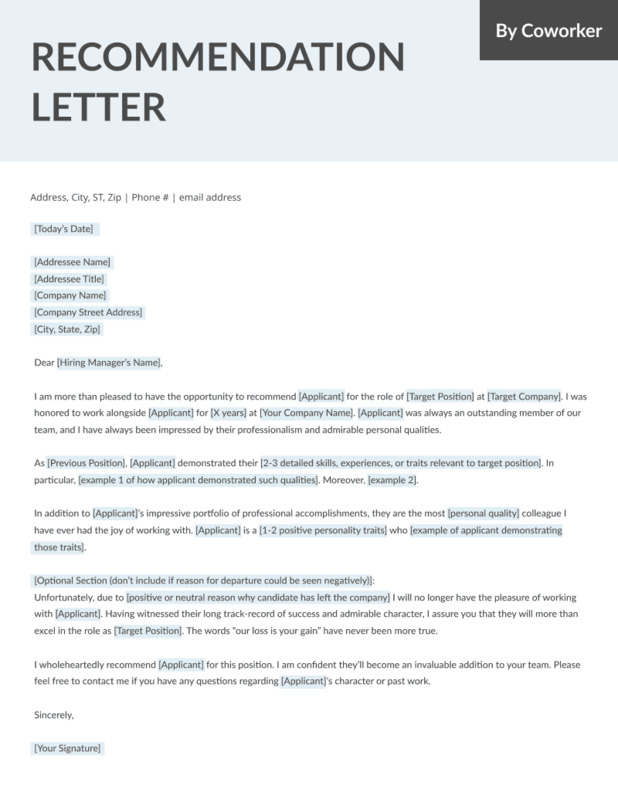 Regardless of your position, downloading and customizing these free templates and samples is a surefire way to quickly and easily write a compelling recommendation letter for employment. 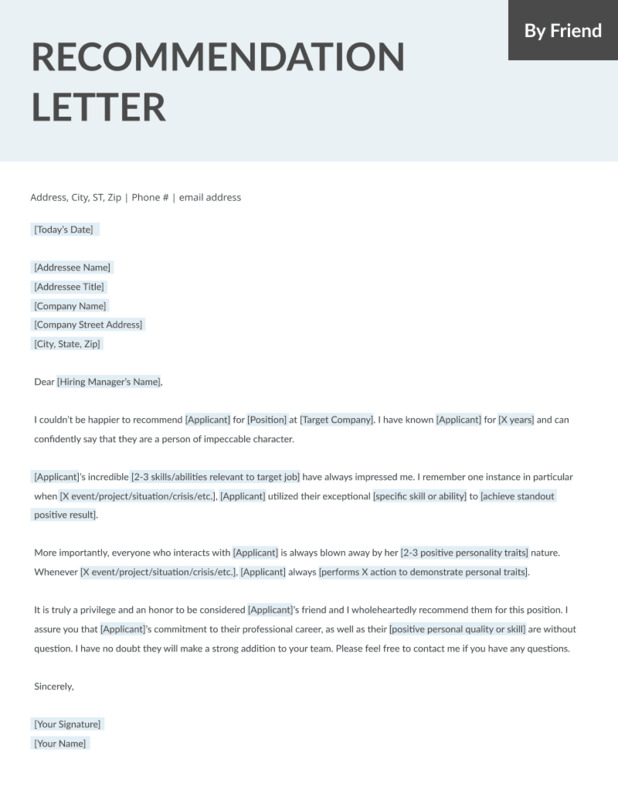 If you’d like some more details or want to write your own from scratch, our comprehensive list of letter of recommendation samples and writing guide has everything you need to know. Thank you a lot of free Help. Our aim is to please! You’re welcome. We hope these samples have proved useful.